The recent US Supreme Court decision in Town Of Greece v. Galloway, opened the door to ‘legislative’ prayer that can be said at the beginning of a government meeting or event. Although the decision disappointed many secular people, some secular groups have decided to join in and encourage seculars to participate in the ‘prayers’ so that our point of view is represented. 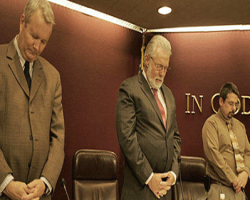 It isn’t the best solution to the divisiveness of government prayer but it may help show the court was wrong to allow prayer in the first place when the Christian’s true colors come out. This entry was posted in Issues and tagged 1st amendment, American Humanist Association, Americans United for Separation of Church and State, Ceremonial deism, church and state, legislative prayer, Town Of Greece v Galloway, US Supreme Court on May 14, 2014 by Doug. Fifty years ago today, the US Supreme Court handed down their landmark decision Abington School District v. Schempp that struck down a Pennsylvania law that mandated Bible reading in the public schools. The case started with a protest in 1956 by then High School student Ellery Schempp. His case showed us the importance of dissent and that mandatory Bible reading, in public schools, infringes on religious liberty. It’s great that Dr. Schempp is still active in the struggle to protect the 1st Amendment and he is definitely a Humanist you should know. 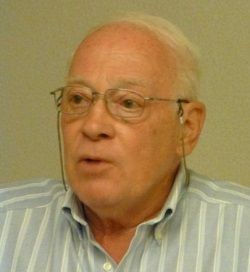 This entry was posted in Humanist Movement, People and tagged 1st amendment, Abington School District v. Schempp, church and state, civil rights, Dr. Ellery Schempp, history, religious liberty, US Supreme Court on June 17, 2013 by Doug.